On Thursday, police officers arrested Julian Assange after forcibly removing him from the Ecuadorian embassy in London, where he had been holed up for nearly seven years. This occurred after Ecuador revoked Assange’s political asylum. He now faces multple criminal charges in the UK, Sweden, and the US; the latter is seeking his extradition for the Wikileaks release of classified information about US war atrocities committed in Iraq and Afghanistan. Forensic Architecture, the international-justice research group based at Goldsmiths and headed by Eyal Weizman, has released a statement on Assange’s arrest. Acknowledging that Assange is far from an “unproblematic” figure, the statement denounces his arrest as a threat to the “right to publish true and newsworthy information” that exposes government crimes and corruption. The statement, copied in full from the Forensic Architecture website, is below. 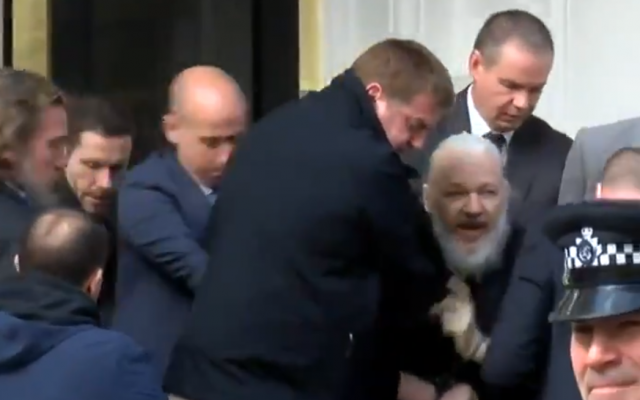 Image of Assange arrest via the Times of Israel.